HomeVotre president est un faux imbécile! Votre president est un faux imbécile! It may not seem of any great moment now, but historians will consider French President Jean-Michel Frédéric Emmanuel Macron’s April 2018 visit with U.S. President Donald J. Trump in Washington and his speech to Congress for centuries to come. One theory posits that Macron “played” Trump like a squeezebox, making a blooming romantic fool of him. Some jokes have been made about the sapling. One casts President Trump as a hypocrite because would not be so kind on the environment as the tree-huggers who love to hate him. 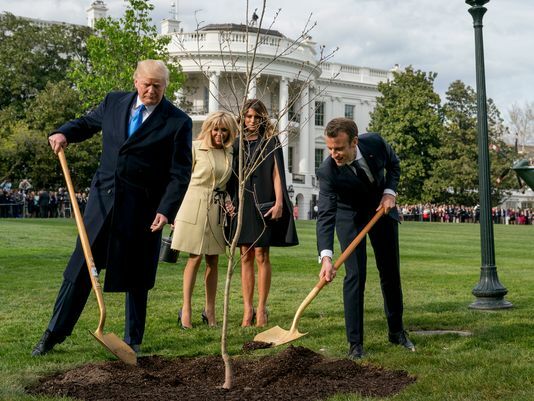 Another joke casts the two presidents as lovers, and claims that love was lost after Macron went on to Congress to glibly denounce Trump’s nationalism, wherefore Trump, jilted, instead of tweeting his ire, emerged from his Hamletian lucubrations in the White House cellar to personally rip the tree out of the yard and order his bodyguards to cremate it, put it in an urn, and return it to Macron. 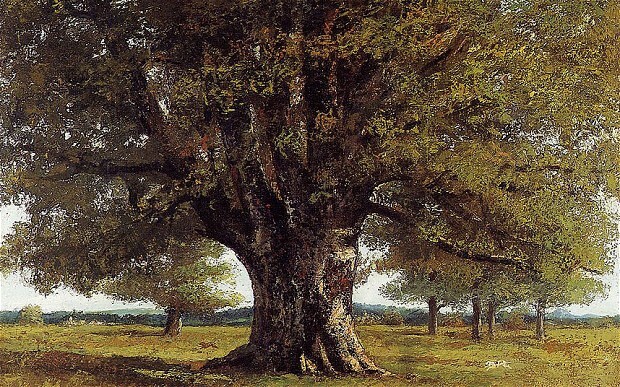 The planting itself was allegedly as symbolic as the tree. The roots were covered with plastic, and the sapling was immediately removed to comply with quarantine law to protect the other trees around the White House from a dangerous French moth. That being said, another theory is that Trump was faking foolishness and feigning madness ever since he infiltrated the Republican Party to sleep with the enemy, plotting to arise one night to betray the Republicans by wreaking havoc for the Democrats. 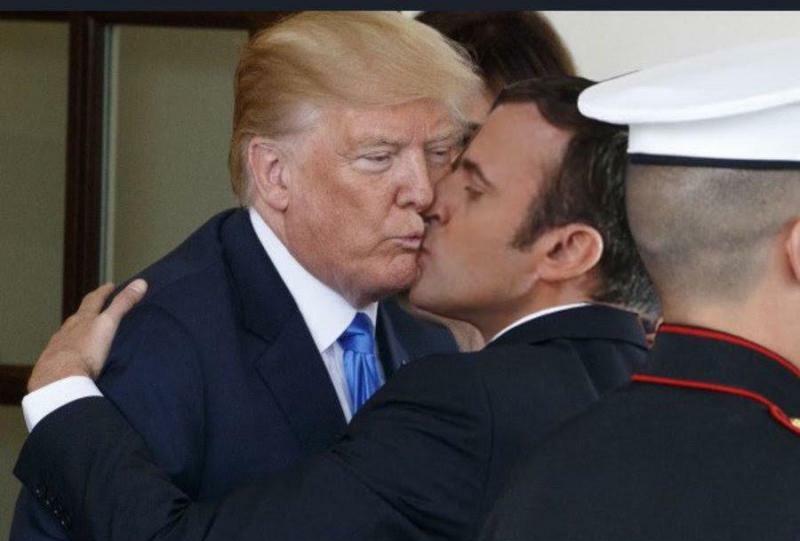 “Votre president est un faux imbécile!” a rumor monger declared in social media after the U.S. president appeared somewhat stupefied by the overly affectionate ‘La bise” bestowed on him by Macron, a kiss deemed “beaucoup trop romantique” by homophobes. But no, the President of the United States is not stupid. 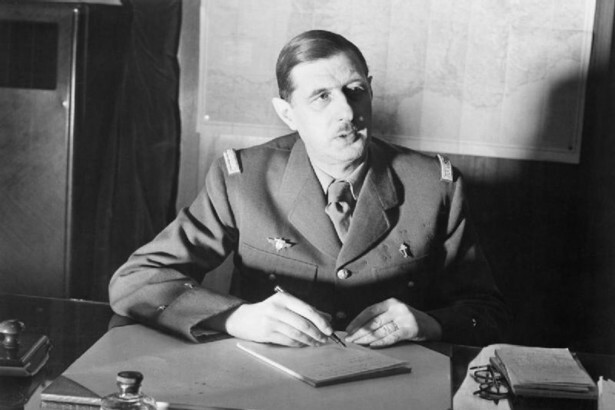 General Charles de Gaul’s Memoirs may be found on his bed stand. Trump was undoubtedly calculating the political-economic benefits to be enjoyed by adopting the sapling president of France. For all his talk about making America great again by economically isolating it to wage tariff wars, there is nothing he enjoys more than trade deficits with political allies against terrorism, especially allies whose terrorism is legitimately organized into formidable military forces. After all, what is not to like about a huge trade deficit? We get more stuff from them than they get from us, and they use our dollars as a world currency backed by the biggest guns, investing a great deal of it in America! Why, make a few threats, recite the Free Trade mantra, get the means to get a little more stuff to make America even greater! No, Trump is no fool, or so goes the rumor. 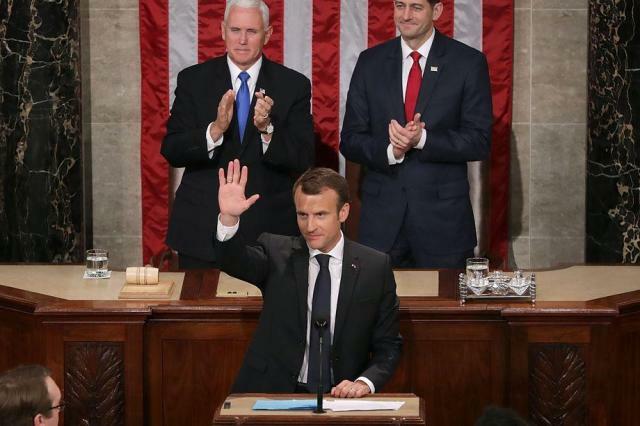 Macron’s speech to Congress was romantic indeed. It was presumably drafted by his wife and high school literature teacher, Brigitte Marie-Claude Macron née Trogneux. Her exemplary appearance proved that France has the most attractive females in the European Union, as is well known by gentlemen who surf the Web for nudes by country of origin. Beware of the feminist cougars, however: they can be hell on high heels after a martini or two. 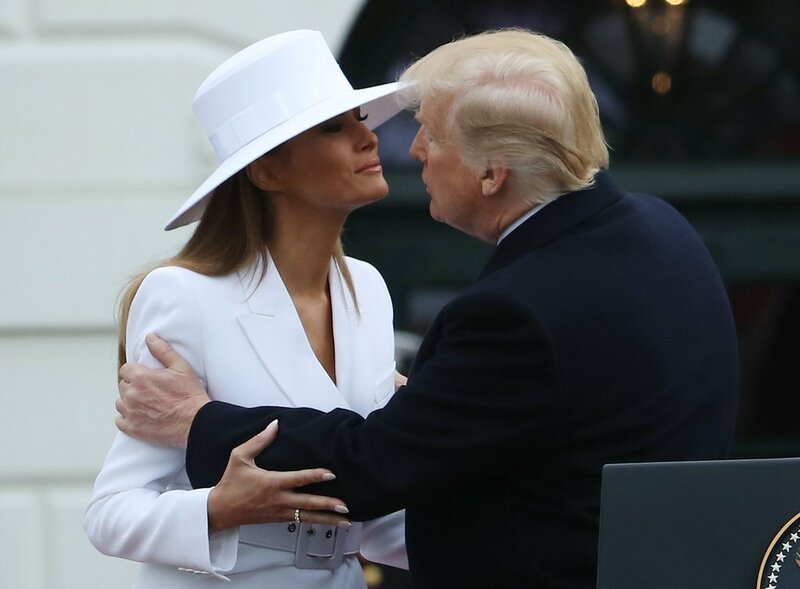 Melania Trump, née Melanija Knavs, a world-class beauty in her own, Slavic right, looked rather grim herself under her broad-rimmed white hat, which rebuffed her husband’s attempt at La bise after he failed to get her a birthday present. Brigitte reportedly felt sorry for Melania because she is cooped up in a White House that The Donald has characterized as a “dump.” She had more freedom in Slovenia under Tito. Her dad registered as a communist as Slovenians were wont to do to advance their careers and obtain favorable housing. France has denied Brigitte the official title of First Lady, but it is safe to say that it would behoove the First Ladies to hold a champagne, macaroon, chocolate and cheese soirée at Carlton Hotel in Lille sometime soon to discuss such matters as the relationship between feminism, communism and atheism, the role of bread and cake in revolutions, whether poudre de perlimpinpin should be legalized, whether the capitol of France should be removed to Lille and the railway system revised accordingly, and so on. Canard-Duchéne Brut champagne would mate well on that occasion with Trogneux macaroons, Léonidas Belgian chocolates, along with mimolette, morbier, maroilles, and roquefort cheeses. Moskovskaya Osobaya and Tito’s vodka would also be available for emergencies. Naturally Macron, a history buff who was at one time a registered socialist, waxed romantically in Congress on the liberal side of the French-American relationship, refraining from mentioning certain antagonisms between French and English culture hailing back to the invasion of William the Conqueror. Witness thereafter the evolution of virulent nationalism and several wars between France and England, drunken brawls over Chaucer’s theft of French words, not to mention plagiarism of whole tales, and France’s attempt to purge English borrowings from its dictionaries. As we know so well, the wars between European powers had to be fought over North America as well. Ten-percent of the inhabitants of the English colonies, advised well on property rights defined as the “Ground of Happiness” by the landed gentry, desired independence from the Mother country. Wherefore the convenient alliance with France, never mind the differences. It is said that there exists a French democratic revolution within the American republican revolution, rendering the United States a democratic republic, a political hybrid that troubles ideologues to this very day. Mind you, political philosophers are free to deny that the so-called American Revolution was a revolution at all, and to insist that it was just a changing of the guard with a few constitutional revisions in a constitution finally written down. Someday, hopefully, a few minor changes will be made in that constitution to restore cabinet government. As it is, a perversely elected president and his appointees may bring the nation to ruin. In any event, the rebels were so sure of their ancient English rights that they believed a bill declaring them would be redundant. The French revolutionaries, on the other hand, wanted to overthrow an ancient regime of hierarchical privileges and establish a flatter or more democratic socialist government. That is why their declaration of rights was a real declaration while the Anglo-Saxon one was a mere reiteration of faits accomplis. French ‘liberty’ and ‘equality’ had a distinct French flavor relished by American visitors to Paris such as Thomas Jefferson, who claimed the Revolution was caused by Marie Antoinette, took a liking to French ideologie, or the French science of political reasoning fathered by Antoine Destutt de Tracy, and replaced Theology with Ideology at his beloved university in Virginia. After all, the goal of political progress to a perfect civilization is liberty for everyone, at least according to the great French eclectic, Victor Cousin, who, thanks to the Prussians, had a significant effect on the philosophy of education in the United States. Of course he noted that progress requires the leadership of Great Men or dictators who embody the French revolutionary spirit, which is somewhat universal since Cousin ventured to Germany and stole a bowl of Hegel’s confounded soup. Hegel was more than enthusiastic or “god-possessed” about the French Revolution before the Terror appalled him. The “Theos” he irrationally intuited was named Reason; to wit: the inscrutable god aka Logos that enlightened the globe from Paris. Indeed, the difference between the French revolutions and other revolutions so-called was that its rights were borne out of the head of Zeus by Athena instead of purchased or inherited as privileges. Mind you that the faults of great men should be forgiven if not ignored, said Cousin, for the sake of progress to Liberty, especially after they are dead when statues are erected to remember them well. We may beg to disagree, and learn much by the faults lest history makes fools of us yet again. Socrates proved the wise were fools. We are all mongrels. 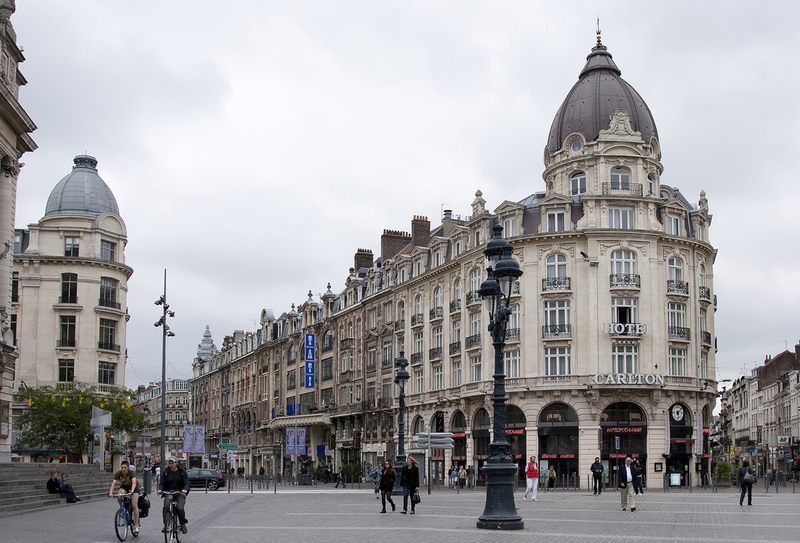 The people of the United States and France admittedly have a fraternal relationship, so let Macron be the son of Trump, as foolish as that may sound. Is a Macron a Great Man or a mark over a vowel in French history?